Jadeveon Clowney should just change his name to Kal-El. Clowney was a 1st team All-American and 1st team All-ACC selection in 2012. His tackle for loss in the Outback Bowl was amazing and is a YouTube sensation. 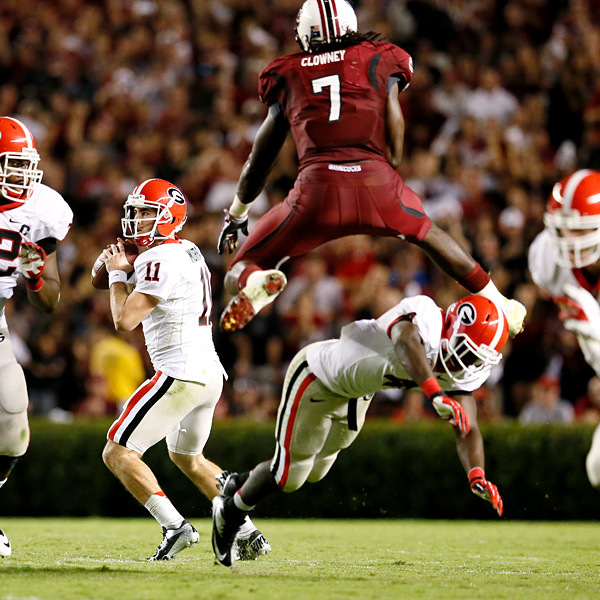 Clowney is an athletic freak who has amazing explosion and unbelievable quickness off the ball. He has the entire package of power, athleticism and quickness. Clowney understands leverage and he does a very good job of shedding blockers. I’m not sure how left tackles sleep the night before a South Carolina game, because they have to know it’s going to be a long day. The only knock on Clowney is his motor. Coach Steve Spurrier called out Clowney and a couple of other dinged up Gamecocks last week. The move was a typical Spurrier motivational ploy and Clowney seems to be back in Spurrier’s good graces. I wouldn’t be surprised a bit if Clowney were the #1 overall pick of the 2014 NFL Draft. Stephon Tuitt has the body type you look for in a 3-4 defensive end. He is physically imposing at 6’6” and 303 pounds with long arms. Tuitt has a knack for rushing the passer and last year he led his team with 11 sacks and 11 tackles for loss. He also returned a fumble 77 yards for a score. Tuitt has the versatility to also move inside in nickel and dime packages. His physical tools are impressive, but he needs to work on playing with better leverage and lower pad level. If Tuitt can improve on his technique and add that to his freakish athleticism, the sky is the limit for him. Tuitt has a good motor and appears to love the game. I believe Tuitt has a lot of raw ability and with the right coaching could be a very special player. Aaron Lynch was a freshman All-American for Notre Dame, leading the team with 5.5 sacks and 14 QB hurries. However, Lynch became homesick for his home state of Florida and coach Brian Kelly let him transfer. Lynch sat out last year and this will be his first year playing for the Bulls. He is an intense player that goes all out on every play. He does, however, sometimes get called for late hits. Coach Willie Taggert will need to work with him to try to eliminate those types of plays. Lynch has good size at 6’6” and 260 pounds. He would be a good fit as a 4-3 defensive end and could probably play the left or right end. Notre Dame lined him up all over the line, taking advantages of match-ups that Lynch could win. It will be interesting to see how South Florida uses him. Morgan Breslin is a JC transfer that has only one year of experience at the FBS level. Breslin successfully made the jump to big time college ball, leading the Pac-12 with 13 sacks and was 4th in the conference with 19.5 tackles for loss. He has a good motor and chases the ball parallel to the line of scrimmage. Breslin is a smart player that reads his keys well and stays home on plays away from him. He will be asked to play a hybrid end/outside linebacker in the Trojans new 5-2 defensive scheme. Breslin has the size at 6’2” and 250 pounds to play linebacker at the next level, only time will tell if he can play in space. He has the quickness to rush the passer from the linebacker position and if he has the flexibility to drop into coverage, he could be a standout outside linebacker. Scott Crichton is a two year starter for the Beavers. He was a 1st team Freshman All-American in 2011 and 1st team All-PAC 12 player as a sophomore. In two seasons he has 15 sacks and 32 tackles for loss. Crichton is very physical and uses his hands well. He plays with good pad level but doesn’t consistently play with leverage. Against the run, he stays within his gap and doesn’t get fooled easily. Crichton has an explosive first step and is a very fluid athlete. He has quick feet, good balance and moves well in space. Despite the numbers, Crichton still has some learning to do as a pass rusher. He has a very good bull rush, but he needs to become a more well-round pass rusher if he wants to be successful in the NFL. This entry was posted on August 23, 2013 by draftmaniacs in Top 5 at each position and tagged 2014 NFL draft, Aaron Lynch, Beaver football, Jadeveon Clowney, Morgan Breslin, NFL Draft, Notre Dame football, Oregon State football, Scott Crichton, South Carolina football, South Florida football, Stephon Tuitt, Trojan football, USC football.